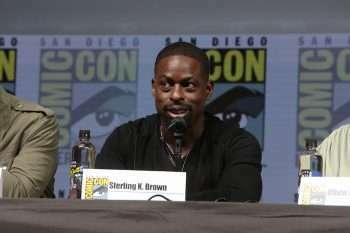 Though he was seen earlier this year in Hotel Artemis, Sterling K. Brown is best known for his work in the critically acclaimed (and universally beloved) NBC series This Is Us. With The Predator, however, Brown takes on an entirely different challenge, and having director Shane Black (Iron Man 3) at the helm is a good thing. Click on the media bar to hear Brown discuss what audiences can expect from the latest iteration of The Predator. The Predator, co-starring Olivia Munn, opens September 14.